Nutritional supplements can be very useful for sustaining joint health, and taking them can help you lead a normal life, even as you age. Your joints, unfortunately, are hit hard during later years, because the cartilage becomes more brittle, and you cannot move around with ease, as you used to. 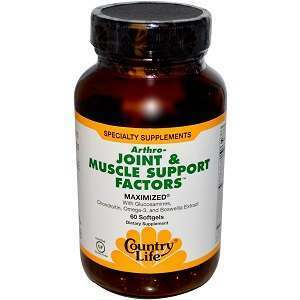 Country Life Arthro-Joint & Muscle Relief Factors® is a health supplement created for providing joints, membranes, tendons, bones and cartilage with key ingredients that delay aging, or repair them. Pain relief is one of the benefits offered by this supplement. Since its composition recommends it, we decided to take a closer look at Country Life Arthro-Joint & Muscle Relief Factors®. What Does Country Life Arthro-Joint Contain? The product reviewed here contains glucosamine and chondroitin, two important ingredients for joint health. However, we see no sign of MSM or hyaluronic acid, both being necessary for a complete formula. The product does contain some of the best herbal remedies, like boswellia serrata, and omega-3, but, otherwise, we cannot see Country Life Arthro-Joint & Muscle Relief Factors® as a complete formula for healthy joints. You need to take three capsules daily in order to get the desired effects. The listing price for a bottle with 60 soft gels is 28.99USD. Since one bottle can last for 20 days, we can safely say that this product is decently priced and in the same range with others. The official website of the manufacturer is scarce in such information. Since it looks like Country Life Arthro-Joint & Muscle Relief Factors® is mainly sold through resellers, you may have to contact them to get a refund, in case you are unsatisfied with the product. Country Life Arthro-Joint & Muscle Relief Factors® is a joint health supplement based on a few important ingredients for relieving pain, reducing inflammation and promoting cartilage repair. From this point of view, it is a good product, and the fact that it also includes well known herbal extracts, traditionally used for joint treatment is a plus. However, the formula looks far from being complete, and there is no clear guarantee offered. Mark Stevens	reviewed Country Life	on October 11th	 and gave it a rating of 2.